The largest donations have so far come from billionaire businessmen and companies such as Apple, Dior, Chanel, L’Oreal, the owner of the media group which owns Le Parisiennewspaper, and luxury goods company Kering which owns Gucci and Yves Saint Laurent, reports The Telegraph. “We are at about 900 million euros and the one billion mark will be exceeded today,” journalist Stéphane Bern told franceinfo. The outpouring of support from philanthropists and Catholics from around the world comes as French President Emmanuel Macron pledged that Our Lady of Paris, the church of France, will be rebuilt in five years and “even more beautifully” than before. It was revealed Tuesday night that the twelfth-century gothic House of God was just 15 to 30 minutes away from destruction as some 400 firefighters battled to stop the blaze that took more than ten hours to extinguish. Junior interior minister Laurent Nunez told media that it was down to just 20 firemen who fought to stop the fire spreading to the two west-facing wooden-framed belfry towers, as senior firefighters feared if they caught alight and fell, it would bring the whole structure down. “They saved the edifice, but it all came down to 15-30 minutes,” Mr Nunez said. The morning after a fire ravaged Notre Dame cathedral, Parisians have embraced the period of faith and resurrection and vow to rebuild. The fire, started after 6pm local time Monday evening, spread quickly across the wooden and lead roof and resulted in the collapse and total destruction of the wooden spire. The belfries, much of the stone vaulted ceiling, the flying buttresses, and, miraculously, three rose windows survived, and so did many religious relics and artefacts rescued from the building including the Crown of Thorns believed to have been worn by Jesus Christ during the crucifixion. The Great Organ of some 8,000 pipes, built in 1403 but replaced in 1738, is said to have been water-damaged but untouched by fire. An investigation has been opened into the cause of the fire, though authorities believe at this point it was not intentional, rather related to ongoing restoration work to the roof and spire, with Le Parisien reporting that initial investigations point to the fire being caused by a short circuit in an elevator that was installed to aid restoration. The fire is believed to have been discovered in the corner near the base of the spire, on the Seine river side. The Times reports that an initial fire alarm at 6:20pm was dismissed as a false alarm, and that the computer system sent three firefighters, who are permanently on site, to the wrong location. Only the second alarm triggered 33 minutes later resulted in the fire being found and more first responders being sent for. Despite authorities pointing to an accident, some have said that the lack of proper funding and upkeep of the building would have inevitably resulted in a tragedy such as this. The Guardian reported of the years-long battle between the diocese and the state as to which will pay for restorations of the building and its stonework, which was described as already crumbling before the fire started. “What happened was bound to happen. 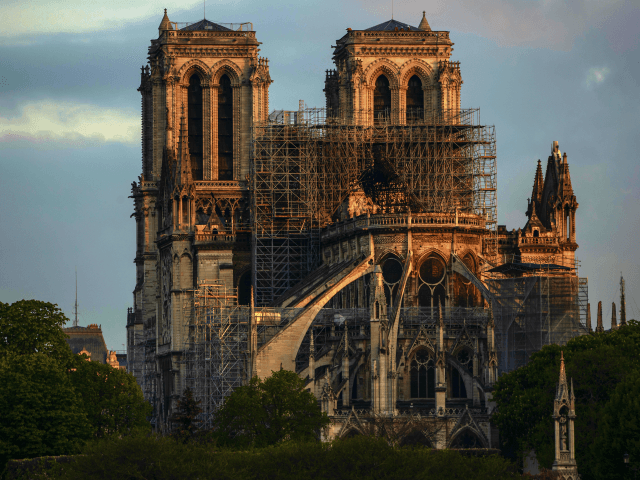 The lack of real upkeep and daily attention to such a major building is the cause of this catastrophe,” said Jean-Michel Leniaud, president of the scientific council at the National Heritage Institute.